I think pie might be the most perfect dessert. You can pretty much make a pie that will make anyone happy. Whether it's rich and chocolately or light and fruity pies are so diverse it's no surprise that the holidays are full of them! 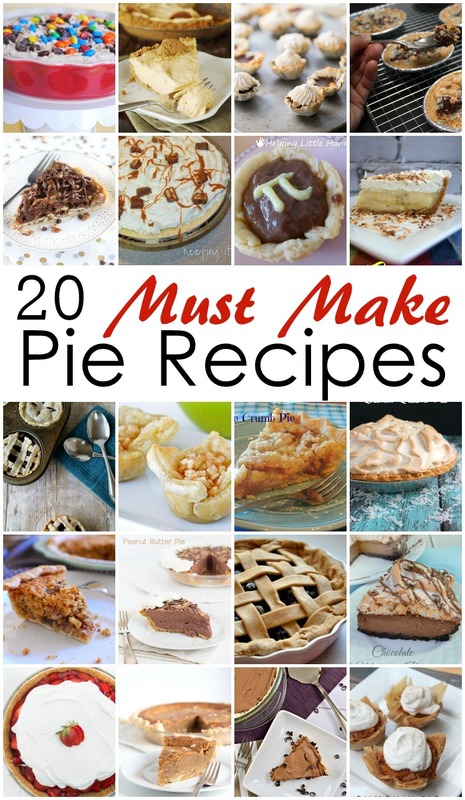 Here are 20 Must Make Pie Recipes and boy do they look delish. Marissa here from Rae Gun Ramblings as your faithful host for this week. The weather has finally cooled here in Utah and it's making me ready for the Holidays. To me on the top of the holiday food list are pies. So sorry if I cause you to drool during this week's party. And in case you haven't been to my neck of the woods lately, here are some of my favorite posts from the last month. If you love comfort food you'll love my new favorite weeknight Crock Pot Chicken and Dumplings Recipe. Oh it's SOOO good my sister keeps asking me to make it ha. I'm so excited about the Hunger Games movie here are some awesome books to read if you loved the Hunger Games. We’d love it if you pinned the Pie Recipe Round Up image above!